The main unit EP-1 offers a lot of features. 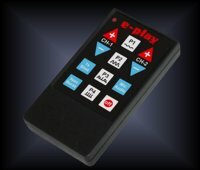 The unique pulse generator allows soft stimulation as well as powerful kicks upon your choice. Using the integrated microphone or the stereo connector the pulse generator will follow to the music. 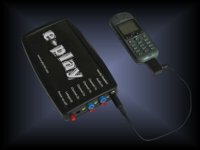 Two separately controllable outputs, rechargeable batteries, wireless remote control and even control by mobile phone offer a unique variety to the user. For more information click the image. Isn’t it an amazing idea to take control over your sub by a simple finger tip? The supplied remote control can be used very easy ant the result of sub’s reaction be viewed from a relaxed point anywhere in the room or even from outside dom has full access on his sub. 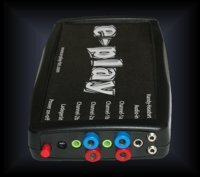 The built-in NiMH-rechargeable batteries of the EP-1 offer power for 4 up to 6 hours playing depending on the intensity. The supplied charging unit is microprocessor controlled to provide optimal capacity and long-life terms. It avoids overloading of the batteries and fits to any wall outlet in the world. This grants fun during holidays as well. Universal connection: Regardless to the slim size there are fitting connectors for the mobile, the headset, a CD player or similar. The electrodes can be attached to the 4mm banana jacks or the 3,5mm walkman sockets. Both channels offer both connectors upon your choice to grant a maximum of flexibility in attaching electrodes.